Rural Revolution: Where do you live? This was so riveting that I called Don and the kids over to see, and we gaped in amazement. Half the population of America crammed into those little tiny spaces. I read last year that 15% of Americans were considered 'rural' and they lived on 72% of the land. Another way to look at it is that 1/6th of Americans live on 3/4ths of the land. I find that hard to swallow considering that the Feds gobble up a large portion of that "3/4ths". I'll bet the writer didn't take that into account. Woohoo, I grew up there! Unfortunately, right next door to one of them (Allegheny County, PA). I wish there were a way to get out of here short of demanding that my husband give up his career or once again moving 1000 miles from my family. We're in the next county over. My MIL, who comes from another "blue spot" (Lee County, FL) thinks we're in the country. The population density makes me have to fight the urge to hyperventilate. Greetings! I live in central PA.
Hi! Nice to meet yinz! LOL, Butler county PA, the county right above Allegheny....Yinz guys watch that Stillers game! Now draw a circle ~400 miles wide (1 tank of gas) around each for an idea of the flood of people you could expect in an emergency. Don't forget about cities just over the border! Mobile, Alabama, or LA as we like to say. (Lower Alabama). More importantly I think it shows the four or five really dangerous regions to be in after a collapse. 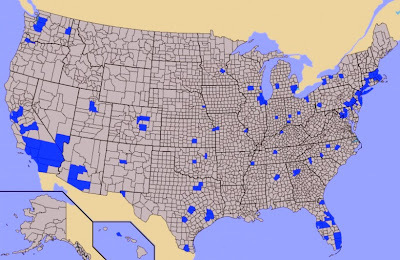 Most of those blue counties down South and in the Midwest are too isolated to be a threat to all that open space around them. The Northeast, Florida, S. Kalifornia and Washington areas maybe some sporting regions for a while though. Northern Illinois and Southern Wisconsin maybe fun as well. i live in Oklahoma, half the population live close to OKC & Tulsa. Rural Oklahoma has been dying for years. Small towns are struggling & have for years. At the end WWII Oklahoma was a rural farming state. We are still a farm state but with a lot less farming population. Large farms are the norm. We are still a rural state with two large population areas in Tula & OKC. One county over from Dallas county Texas. I do drive into Dallas to work, but enjoy the less populous East Texas to live. One of the blue area, PRC(Peoples Republic of Chicago) Crook County, IL. I live in Downtown Coeur d'Alene. Just happened on your blog and have been reading it a couple of years. One of these days I'm sure I'll run into you and I'll introduce myself. Love your blog and wish I was a little more "rural"
I would guess that a map of where most of the welfare money is spent would look like this too. And of course a map of where the most liberal/socialist congress people are elected would be the same as well. For years we lived in grey and I commuted to blue. For a couple of years grey for both. I think that's why they call it "The Blues"
Hmmm... to my surprise, I live off the coast of the Baja peninsula. So why am I wearing fleece right now?? I'm immediately adjacent to one multi-county blob. Although already in the exurbs, I'm planning on moving about 60 miles farther out--which won't make the commute any better. On balance I think it's a good tradeoff. Almost by definition, most people live close to or in one of those blue counties. They aren't all uniformly bad, but the thought of living in one of the big dense areas (like the mass sometimes referred to as 'BosWash') is not at all attractive to me. Fairfield County, CT. Very, very blue. Up in the hills north of Nashville, Tennessee. North and east of the Dallas, Fort Worth, McKinney metro mess. Lake County, Indiana. (Yeah, it's one of the marked ones.) It's the sort of place where folks in Chicago come on the weekends to buy their gas and cigarettes and alcohol (all taxed much higher in Illinois) and fireworks (illegal in Illinois)...and folks like me live, so we can be within commuting distance of jobs while avoiding the legal environment in the city. Unsurprising to see my family (Wayne, Oakland, and Washtenaw counties in Michigan) make the list. A bit more surprising to see my in-laws (Kent county, also Michigan...it's that one in the Western part of the state, not near Detroit) made it...Grand Rapids certainly doesn't _seem_ like a major population center. Unfortunately, I live in one of the two blue counties in AZ. The county is huge and we are on the far edge of it so it isn't too bad. I have also lived in Post Falls, ID and Wisconsin. I prefer either to AZ, but it's where we are for now. Santa Cruz County, AZ here, east of the blue. WE have 48.3 people per sq mile. I am also in SoCal. High desert to be exact, and I'm also a teacher. I use to teach now I homeschool, we are in the bowl of the vine. :) I bet ur up in V Vill area.. Despite what all of the "experts" say, the jury is out whether living in the hinterlands is better than being near a main artery roadway. There are positives and negatives no matter where someone lives. You love where you live so much, you have forgotten that many people love the city/dense suburbs. One man's poison is another man's medicine. The map is more for amusement than for statistics. I live in Tennessee down near the bottom not near the blue. Lots of farming here and Amish. We are in Georgia, but not in the blue area. Hubby, however, does have to commute to the blue for work. It's a pretty hefty commute, though. I live just north of Cartersville and commute to Midtown. Rough commute to say the least! I am in a NON blue county in Florida. One of the differences in our state is that most of that BLUE you see is made up of OLD people...and I don't see them lasting very long if things get bad. SW Florida between the 2 blue counties. And I don't see us older folks leaving or lasting any less time than the younger folks if things get bad - after all, most of us have been thru bad times before and we know how to cope. Thankfully, I do not live in one of those tiny spaces. Southwest Missouri, but still too close to those blue counties! This map depicts the areas overflowing with ‘grasshopper people.’ I believe the demographics of this country will drastically change when chaos hits. Government’s so-called hoarders may actually be ‘ants’. I'm just right outside the Memphis area. Not surprised to see it in the blue. Wish I could get further away. I know where Walton is ~ I'm in southern Carroll county. Commute 70 miles to Wichita, KS. Living in the Flint Hills is great but services are few. Both daughters now live in major blue areas. I guess they both like their new lives in the big city, but I hate the noise, smell, and busyness. Look for the big blue spot in the Mid-Atlantic region of the East Coast, I am at the tail end of that. Still in the blue, Wilmington DE. Do any of you in the Grey counties want to lease a portion of your land in the event of .....just think, I likely will never make it and you will earn $$ waiting for the disaster. Central Alabama and thankfully not in the blue spot! Between Lake Michigan and Lake Superior in da U.P., where summer is 3 months of poor skiing. I'm south of D.C. Thought there would be more blue in northern Virginia but maybe it's impossible to tell from the small map. I am in one of the blue blobs in Southern California. I don't live in a major city, but it is not the rural place it once was. My daughter and son-in-law got out of CA years ago, they were in MT, now in ND. My son just moved to CO, one of the blue blobs too. It is a school/work thing for him. I would like to get out of CA ASAP, working on that plan. I'd like to be closer to my grandchildren, and not be in a blue blob when the "bleep" hits the fan. Up the road and over the hills from you....Liberty Lake, WA when we are not at our off the grid cabin northeast of Sandpoint, Idaho. Black Mountain, NC. Live in grey, work in grey. I live right in the middle of one of those blue counties--that is where God has put us for now, but I am looking forward to getting out. We do what we can. Unfortunately... wish I was in Wolf Point, MT as far from blue as you can get. Western North Carolina is home for us. N of Atlanta and NW of upstate South Carolina. Way too close to blue but needing to stay close to family. Two homes: County 3 WY, and county 3B ID. Both grey. Three adult kids in KCMO and one just outside the blue of Georgia. They like the city...for now. Only one kid married with kids and he thinks the rural life looks better each year. I live in the land of Moonbeam-Brown in the foothills overlooking the Sacramento Valley but no where far enough to escape the corruption of the blue machine, open borders, heavy taxes, the fast train to no where, abundance of homeless and poverty, the golden gate to perversion, water rationing, the soon to be 75 cent a gallon gas tax and teacher unions that have destroyed our education system. Yep, the Golden State looking more like " poop " Brown---again. Very rural area of ND! Live in Kittitas County near Lake Cle Elum.